Max Ophuls' The Earrings of Madame de... is one of the most critically acclaimed films of all time. Andrew Sarris, who used Ophuls as the basis for his "auteur theory", often referred to it as the greatest film of all time, and Dave Kehr went one better by calling it "one of the most beautiful things ever created by human hands". • Commentary - audio commentary by film scholars Susan White and Gaylyn Studlar. The commentary was recorded exclusively for Criterion in 2008. • Introduction - director Paul Thomas Anderson (Magnolia, There Will Be Blood) introduces The Earrings of Madame de... and discusses key sequences from the film. In English, not subtitled. (15 min, 1080i). • Ophuls' Collaborators - three interviews with three of Max Ophuls' collaborators. The interviewees discuss their work with the legendary director as well as his directing methods. 1. Assistant director Alain Jessua. The interview was conducted by Robert Fischer in Paris in 2005. In French, with optional English subtitles. (26 min, 1080i). 2. Cowriter Annette Wademant. The interview was conducted by Martina Muller in Paris in 1989. In French, with optional English subtitles. (7 min, 1080i). 3. Assistant decorator Marc Frederix. The interview was by Martina Muller in Paris in 1989. In French, with optional English subtitles. (7 min, 1080i). 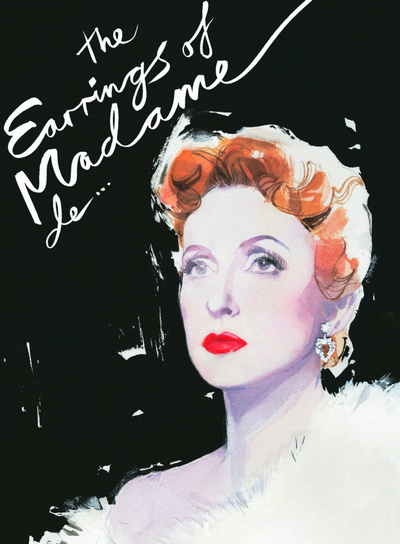 • Visual Essay by Tag Gallagher - in this visual essay, writer Tag Gallagher discusses the style and structure of Max Ophuls' The Earrings of Madame de.... The essay was produced exclusively for Criterion in 2008. In English and French, with optional English subtitles where necessary. (18 min, 1080i). • Novelist Louise de Vilmorin - in this interview from November 20, 1965, which was included in an episode of the French television series Demons et merveilles du cinema, Louise de Vilmorin discusses Max Ophuls' adaption of her novel. In French, with optional English subtitles. (5 min, 1080i).